The 10-year yield touched a low of 1.395% overnight amid heightened fears that Spain will need a full-blown sovereign bailout. Click the chart to check more bond yields. 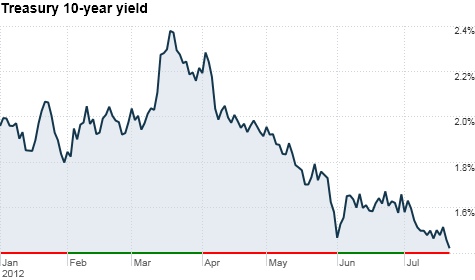 NEW YORK (CNNMoney) -- Escalating fears about Spain's debt problems sent investors rushing to safe haven investments Monday, including governments bonds in the United States, Germany and the United Kingdom. As investors scooped up U.S. Treasuries, yields on the 10- and 5-year notes, along with the 30-year bond tumbled to fresh record lows. Investors tend to snap up Treasuries during times of uncertainty since they're backed by the government. The 10-year yield touched a low of 1.395% overnight, while the 5-year yield dropped to 0.541% and the 30-year sank to an all-time low of 2.476%. While eurozone finance ministers finalized initial bailout terms for Spanish banks last week, observers are concerned Spain will need more. "The steps taken to relieve market anxiety about Spain have failed," said Jim Vogel, interest rate strategist at FTN Financial. As the Spanish economy continues to slow and that nation's bond yields keep surging, experts are worried that Spain will soon require a full sovereign bailout, similar to those granted to Greece, Portugal and Ireland. The yield on the 10-year Spanish bond jumped to a euro-area record high of 7.565%, which is an unsustainable borrowing cost and among the first signs that a country may need a bailout. Investors also moved into debt backed by governments in Germany and the U.K, since they are also considered to be safe haven investments. The 10-year yield on the German government bond fell to record low of 1.127%, while the 10-year British bond yield dropped to 1.407%. In addition to worries about Spain, investors were also on edge about Greece after Germany's vice chancellor "voiced skepticism over Greece's ability to meet its bailout commitments, renewing suspicions that the country could become insolvent and leave the common currency region," said Wells Fargo Advisors analysts. Though investors have been favoring U.S. Treasuries as a haven from Europe's debt crisis for some time, Vogel expects bond yields to pull back from these record low levels. "The anxiety about Europe takes two or three days to run its course, but then investors will go back to focusing on the U.S. economy, and that should pull yields up from this historical low range," he said.